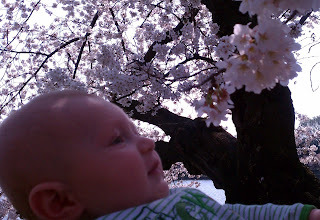 Motherhood and Music: Cherry Blossoms! Back in Idaho we celebrated dogwood blossoms each year. It was a big deal, and the whole community was involved. My home town's college had a festival with a quarter carnival, art displays, and a flea market. Every year in elementary school we'd participate in an art project surrounding the dogwood blossoms. 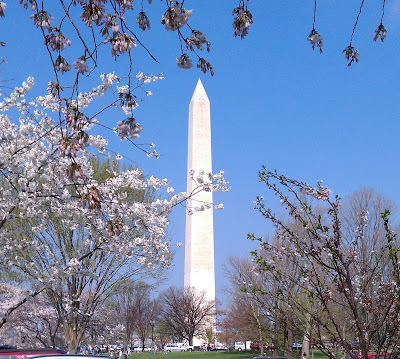 In Washington, D.C., the thing is cherry blossoms. 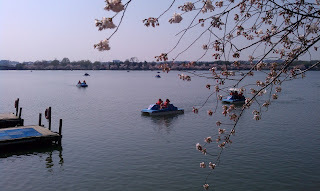 Yesterday we headed to the tidal basin for a stroll through the trees. It was a gorgeous day with lots of people out taking pictures. We tried to share our enthusiasm for nature's beauty with Gummy. He wasn't convinced. 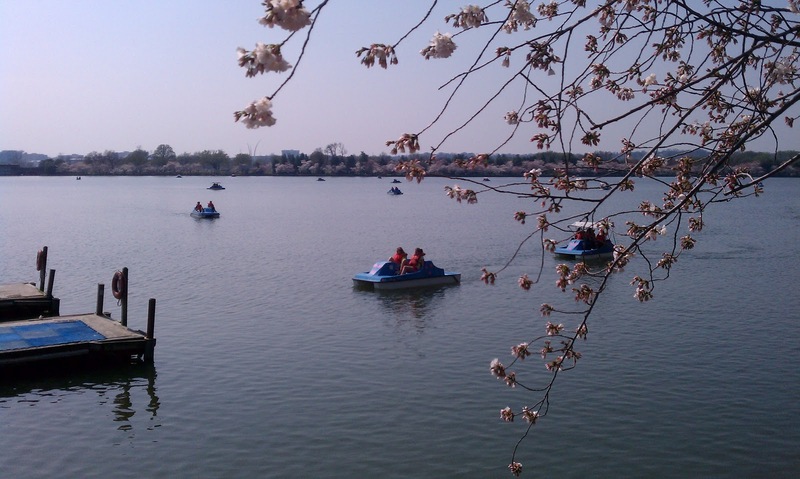 The water was full of paddle boats. It looked like so much fun! We hope to go back in the next few weeks to try it. If you are willing to wait in a line for a bit, two people can get out on the water for $12/hour or four people for $19/hour. And a stop by the Martin Luther King, Jr. monument. The whole excursion was wonderful except for one small thing. While we parked (there were spots near the USDA building), Chris and I were discussing some controversial legislation and completely forgot to pay for our meter. We didn't remember until we had walked a block and a half away. Chris turned around to run back, but it was already too late. $50 ticket. Frowny face. oooo the trees are beautiful! I guess we just missed them blooming! 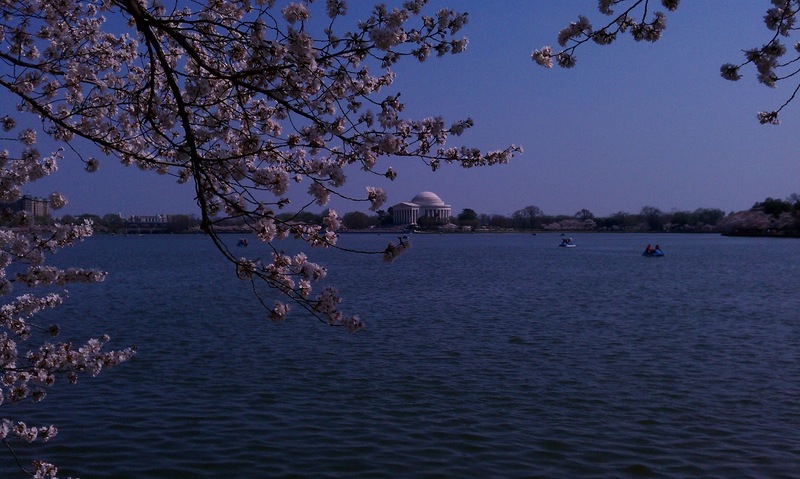 this is the anniversary year i believe for when the Japanese gifted 100 cherry blossom trees to the US so beautiful. My favorite flowering tree! These are always something I have wanted to see in person! They are so beautiful! I love your new blog! 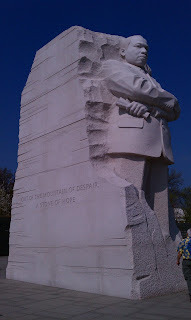 Makes me a teensy bit homesick for DC -- enjoy for me!! Gummy is getting so big -- what a cutie! Hi! I'm Olivia. I write about the two things I love most: music and family. All content copyright Motherhood and Music, 2014-2015, unless otherwise attributed. Simple theme. Powered by Blogger.